The Internet of Things (IoT) surrounding shipping, logistics and transport is growing in size and sophistication. This IoT ecosystem becomes active when mobile connectivity meets vehicles and containers equipped with sensors. With a two-way channel to the cloud, connected assets share and receive data. The possible uses for that data are just beginning to be realised. From location tracking to assisted and autonomous drive, IoT is transforming the entire transport chain. Modern telematics systems are capable of analysing vehicle performance and driver behaviour, providing comprehensive feedback to both managers and drivers. Telematics and tracking allow for optimised route planning and vehicle maintenance based on near real-time data. For commercial fleets, managing fuel consumption has long been a challenge. Telematics allow vehicles to record detailed input such as road conditions and elevations. This data can then be used to guide other connected vehicles to accelerate and brake more efficiently. As better performance leads to reduced emissions, fleets are also able to become more green and improve corporate responsibility. Faster LTE and 5G enable effective V2V data communication. In the long-term, the shipping and transport market is expected to become increasingly dominated by a handful of players operating across multiple continents. With better oversight, fleet managers can effectively coordinate drivers, dispatchers and call centers across wide areas. Assigning routes and loads is easier with real-time details on the location and condition of vehicles and goods. IoT technology also helps reduce the risks of theft and piracy, container damage, and disruption of refrigeration. Getting the product to the customer at the right time, right place and right cost is what the business is all about. IoT provides global scale with close-up focus. Instead of scanning bar codes, it is becoming economically feasible to use sensors to track assets in transit. Detailed updates let customers know customers exactly when to expect their delivery. In Europe, drivers are legally required to accurately record their activities, retain the records, and produce them on demand to transport authorities. Digital tachographs which record speed, distance, and driver’s activity ensure regulatory compliance and accurate record keeping for the entire fleet. Using data from connected vehicles, insurance companies are offering fleets policies with rates based on usage, driver behaviour and other variables. These models are called user-based insurance (UBI), pay as you drive (PAYD), and pay how you drive (PHYD). Already a standard procedure in the UK, US and Italy, insurance underwriters in many other countries are preparing to provide UBI. Stolen Vehicle Tracking (SVT), or Stolen Vehicle Recovery (SVR), is also growing in popularity. In the event of a reported theft, the SVT system interacts with the police to locate and recover the stolen vehicle. Factory-installed telematics hardware is becoming standard in commercial vehicles. This puts the pressure on OEMs to either build IoT competence in-house, or to work with specialised service providers. Manufacturers also must decide how to work with aftermarket players to offer in-vehicle software and connected services. With undefined possibilities, end-user data is a valuable commodity. Finding ways to use that data effectively could lead to collaborations with both disruptors and established players in logistics ecosystem. 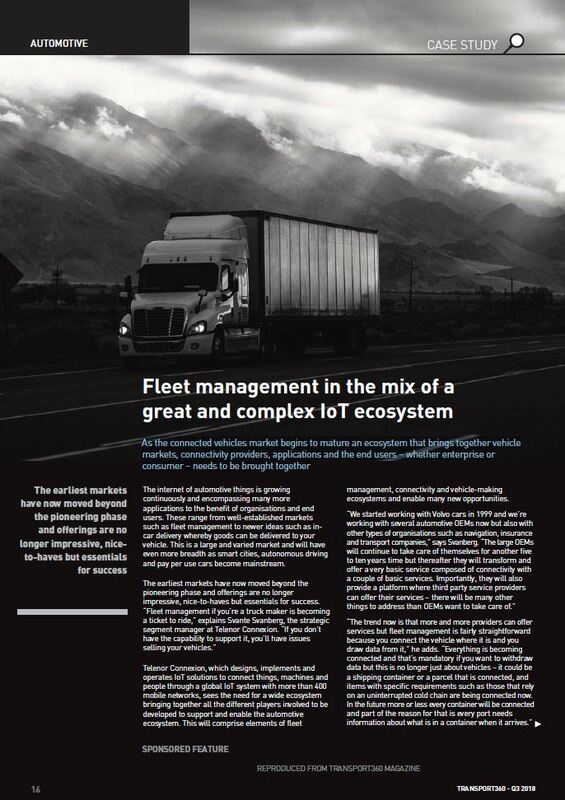 Today, IoT solution providers usually act as the gatekeepers for commercial vehicle data, but open interfaces are giving fleet managers more control. The ability to collect data from mixed fleets will allow fleet managers to assume a more prominent role, working in partnership with OEMs who can only collect data from the vehicles they manufacture. As mobile communication become increasingly rapid, vehicles are able to communicate in near real-time. This allows trucks to drive in platoons, automatically maintaining speed and distance between one another. Not only does this free up space on the road for other vehicles, it also produces less air drag, which leads to lower fuel consumption and emissions. Commercial vehicle OEMs are increasingly expected to integrate video-based solutions in standard offers. These cameras allow work to be automated or performed remotely. As technology improves, drivers may be able to issue instructions to the truck with a simple move of their hand or a few words.